Well, here you are, hoping to find a reliable, knowledgeable, and professional log home care company to assist you in fixing, restoring, or maintaining your log home or log cabin. You can say your search is over, because you have found 888-LOG-GUYS, the best in the log home care business! 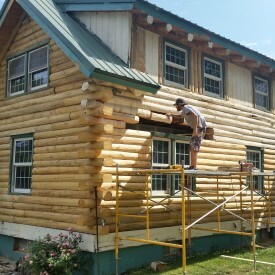 Our services include log home restoration, log home repair, log home chinking and caulking, log home improvement, and log home maintenance. If you don’t believe we are the best, then take us to the test! Our professional staff is ready to listen and serve you in the Covington Tennessee area! Oh, no! Time has slipped by, and you now have a log home that is really overdue for it to be cleaned. 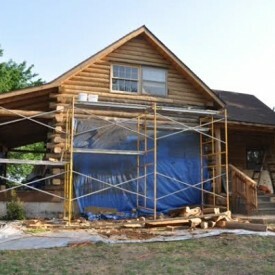 If you think your home is now in need of log home restoration, then you are so lucky to have found 888-LOG-GUYS! We use the best products to media (corn cob, sand, glass, or walnut) blast, sand, clean (with a borate treatment), chink or caulk, and stain your log home or log cabin to preserve its amazing beauty! You will be completely satisfied with our work, guaranteed! Give us a call or request a quote online today! Did you see holes in your logs? Did you find log rot on your log home or log cabin? Did you notice how your logs feel soft? If any of these cases are yours, then give us a call! 888-LOG-GUYS has repaired or replaced many logs damaged by rot, insect holes, bird holes, and severe storms. 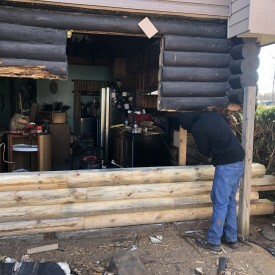 When you decide to have our crew help you, you have over 15 years of log home repair and log replacement on your side! As you browse our website, take a few minutes to send us an estimate request online. You will see for yourself how 888-LOG-GUYS do the best job with minimal cost to you! An energy seal applied on a log home or log cabin is an important way to keep your home cozy and comfortable. When chinking or caulking is properly placed in between your logs, you avoid the following annoyances: water leaks, invading insects, and air drafts. Keep your log home secure to protect you against nature’s elements. There is no reason to put up with it anymore, especially when 888-LOG-GUYS can save you time and money in the process of getting the job done for you! We would love to help you in the Covington TN area! 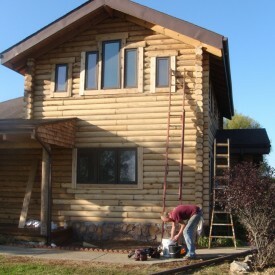 When it comes to log home restoration, you can always count on us! 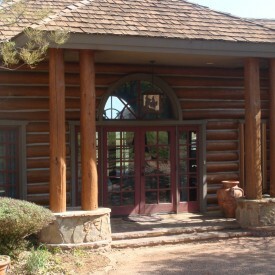 But, did you know that we also specialize in log home improvement? Although our services do not include log home construction and building log homes, we can build log staircases. We have finished log railings. 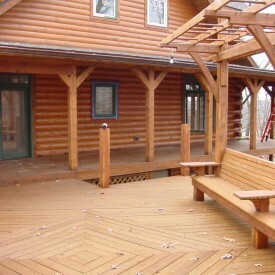 Our carpentry skills ensure that we can build your new deck, patio, or porch to complete your log home or log cabin. Let us build your dreams into reality! Call 888-LOG-GUYS for a free estimate, or you can ask for a quote online! It only happens every four to five years, but it is always inevitable. The upkeep of your log home is important, cleaning the logs to make sure they stay in good condition. To save you a whole lot of time and a whole lot of money in the long run, ask 888-LOG-GUYS to clean and maintain your log home or log cabin in the Covington Tennessee area. We will keep track of when your log home is due to be maintained so that you don’t have to worry about it! Give us a call today or ask for a free estimate from our website!